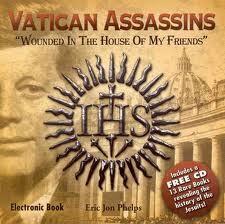 5/3/07 Eric Jon Phelps “Vatican Assassins, Wounded in the House of My Friends” exposes the Jesuits and those who avoid covering it. Luciferians, Sons of Loyola, Jesuit’s wars and more. Remember the Jesuits are at the top of the foodchain (over the Zionists and the rest). They only answer to the controllers of this planet……..